Readers will remember the Rena running aground on Astrolabe Reef near Tauranga back in 2011. Scores of containers fell into the sea and leaking oil polluted the ocean and nearby beaches. Hundreds of birds and fish died as a result. Unfortunately this is not an uncommon occurrence. It is estimated that up to 10,000 containers fall off ships every year. They may float for more than 50 days and be a hazard for any craft on the high seas. 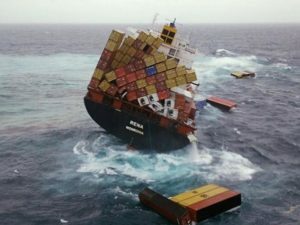 About a week ago, 83 containers fell off a ship in wild weather off the New South Wales coast. However this is not the biggest problem the world’s oceans have to cope with. Once regarded as a wonder product for wrapping and storage, the ubiquitous plastic is the world’s greatest pollutant. Oceans, which cover over 70% of the Earth’s surface are especially vulnerable as they have long been regarded as a convenient dumping place for rubbish. 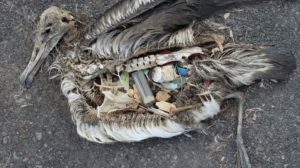 A few years ago I saw a video of the tragic case of Midway Island birds dying of plastic. When autopsies were done their stomachs were found to be full of plastic waste. Sadly it is happening all over the world. Here’s a summary from a United Nations website of the impact of plastics on the ocean ecosystems. 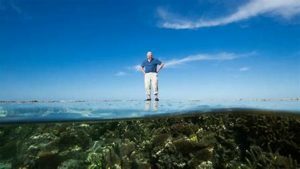 Much has been written on the plastics problem in recent years, and documentary makers from Jacques Cousteau to David Attenborough have visually highlighted the immense problems. As the UN Director General says, we can all do our bit. But we need help especially from supermarkets and other shops. Awareness raising in New Zealand has picked up in recent years and some of the big chains are looking at phasing out plastic bags. In the San Francisco supermarkets if you want a bag you are given a strong paper one. However, one of the problems currently for us in New Zealand is buying vegetables and fruit. If you want 16 brussel sprouts, 9 mandarins or 12 plums you are only offered a small plastic bag to put them in. The campaign to reduce the use of plastics and perhaps ban them, may need parliamentary legislation as has happened in France. 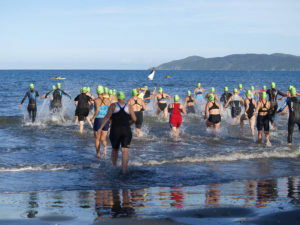 provide enormous pleasure for the general public, notably those who like to be beside the seaside, swimmers and boaties. They cover most of the planet and must be cleansed and preserved. It has to be a united international campaign. I қnow thіs ѕite offers quality dependable articlеs and other information, is there any otheг site which provides this quality information? Then make sure, you make good your mistake, by demanding Malaysian to stop supporting PH cos you understand Najib were the good guy.